I love to buy beets with the big, leafy greens still attached. It makes me feel as if I’ve just pulled them from the ground myself! 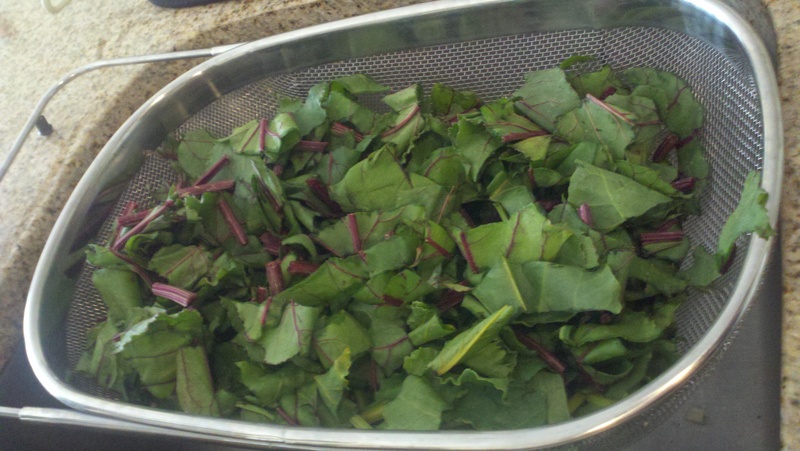 Beet greens have a sweet and mild flavor that’s preserved when you wilt instead of boil them. These delicate greens are delicious served hot or room temperature and the only additional flavors I use are salt, pepper and garlic. You can garnish with chopped beets or enjoy them all on their own. And you can use the stems of the beet greens as well as the leaves themselves. The stems add a tasty layer of texture to the greens. Cooking time is between 10-15 minutes and prep is super quick so this is a go to dish when time is tight. 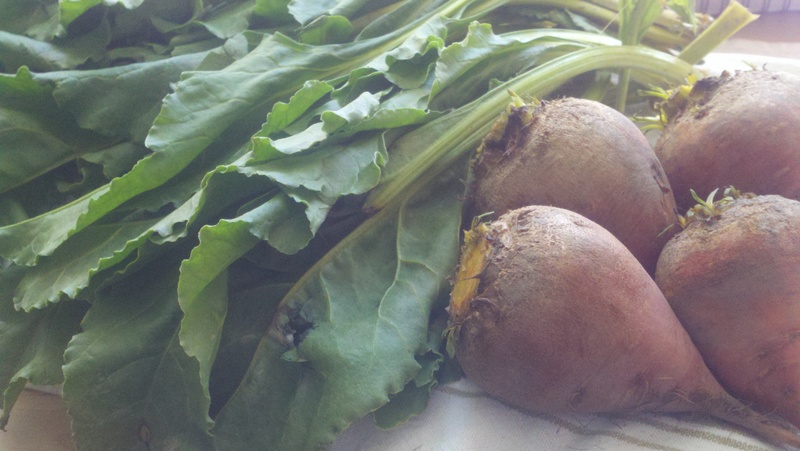 I’ve found that a medium sized beet (approx 3″ diameter) will yield 3/4 to a cup of chopped beet greens. Remember, one beet can have 3-4 leaves. Cut the leaf stems 1/2″ from the beet and rinse, rinse rinse your beet greens well. They are pros at hiding dirt and sand. 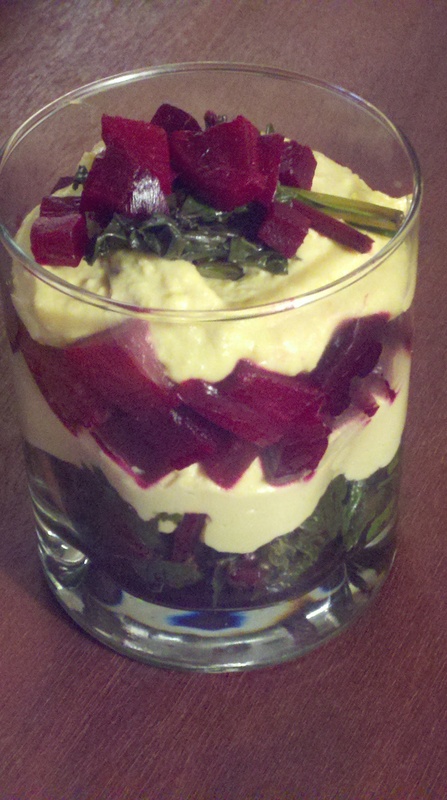 This recipe calls for 4 cups of chopped greens so you’ll need about 4-5 medium beets. Gently saute the garlic in olive oil. Add salt/pepper. 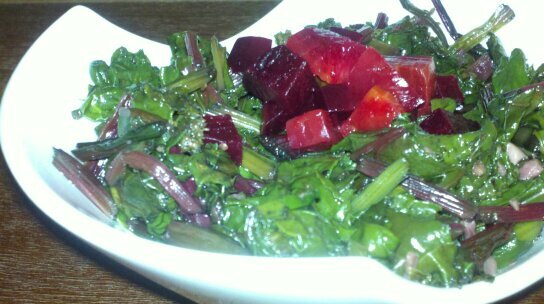 Add vegetable broth or water and chopped beet greens. Cover and cook over low heat for 10-15 minutes until leaves are wilted and tender. Enjoy with in pita pocket with hummus or skordalia for a seriously tasty lunch. If you’re entertaining, layer the beet greens with hummus or skordalia and chopped beets for a veggie trifle!